The look of disappointment on Oliver’s face when every hand goes up is one of the most delightful images ever shown on television. It never fails to cheer me up. After watching it for the umpteenth time, I noticed something. None of the children appear to be obese. In fact, it is difficult to spot many obese kids in any of Oliver’s series involving children. Jamie’s School Dinners was filmed at the height of the childhood obesity ‘epidemic’ and yet there was little sign of it in the cafeteria. Fat kids were also surprisingly rare in Jamie’s Return to School Dinners and Jamie’s Dream School. There were one or two, of course – as there always has been – but at a glance there were far fewer pudgy hands, chubby faces and double chins than one would expect in a country where a third of secondary school children are said to be overweight or obese. You may have noticed the same thing if you drop your children off at the school gates or flick through the school news in your local paper. You may even be one of the bemused parents up and down the country who receives a letter from school informing you that your seemingly healthy child is borderline obese. And yet, one in ten kids are classified as obese when they start primary school and one in five are obese by the time they start secondary school. According to the latest figures, 23 per cent of 11-15 year olds are obese. And that’s before we add those who are merely overweight. These are shocking statistics and we are reminded about them at every opportunity. Organisations like Public Health England repeat the claim that ‘more than a third of children [are] leaving primary school overweight or obese’ like a mantra whenever they have a new anti-obesity wheeze to push. So where are they all? You can’t see them because most of them do not exist. They are a statistical invention. The childhood obesity figures in Britain are simply not worth the paper they are printed on and the childhood obesity rate is much lower than 23 per cent. Let me explain. Obesity in adults is easy enough to measure. Body Mass Index (BMI) is weight in kilograms divided by the square of height in metres. A BMI of 30 or more is classified as obese. In theory, the cut-off of 30 is used because this is the point at which being fat increases the risk of premature death, but it also happens to be a round number. A BMI of 25 or more makes you overweight, but this isn’t really based on anything. It is purely a round number. There are well known problems with BMI, not least the fact that it does not distinguish between muscle weight and fat weight. It is excess body fat that we are interested in and this is best diagnosed by clinical examination, but when that is not possible (as when estimating figures for an entire nation), the BMI system correctly identifies obesity around 80 per cent of time. But it doesn’t work with children. Kids are not shaped like adults, do not have the same fat/muscle ratio and are growing. They rarely have a BMI over 30. An obese child can easily have a BMI of less than 25. Moreover, obese girls have different BMIs than obese boys. 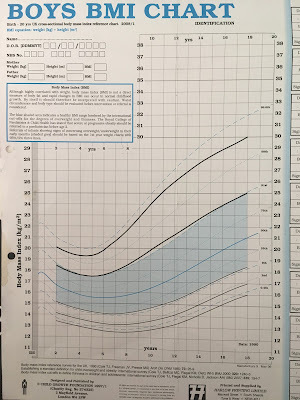 To make up for this, clinicians use a chart like the one below which gives bespoke, age-specific and gender-specific BMI cut-offs for children. For example, at the age of six and a half, boys are considered obese if their BMI exceeds 20.2. By the time the boy is eleven, the cut-off has risen to 25.1. To see how these cut-offs are derived, we need to look at the work of Professor Tim Cole and his colleagues. In 1995, they published a much-cited study upon which the chart above is based. They studied the BMIs of children at different ages and divided them into percentiles. This allowed clinicians to compare the BMI of their patient to that of their peers. For example, if a girl’s BMI was at the 90th percentile, only ten per cent of her peers had a higher BMI while 90 per cent of her peers had a lower BMI. The data used by Cole et al. were taken from between 1978 and 1990, before the rise in childhood obesity got underway and gave us a reference point from which future changes in obesity could be measured. For example, if obese 11 year old boys in 1990 had a BMI of 26 and were in the 99th (top) percentile, the obesity rate was one per cent in 1990. To update the statistics, we only need to measure today’s 11 year old boys and see how many of them would have been in the 99th percentile in 1990. If four per cent of them have a BMI over 26, they would have been in the 99th percentile and the obesity rate is four per cent. This system made it possible to estimate child obesity rates nationwide without clinicians having to examine anybody. Detailed figures have been collected by the UK government since 1995 and all the child obesity estimates published by the NHS and Office for National Statistics are based on Cole’s reference curves from 1990. They came to a similar conclusion when they published further research in 2000. Looking at BMIs in Britain between 1978 and 1993 (‘predating the recent increase in prevalence of obesity’), they found that obese 18 year olds were at the 99th percentile. In other words, only one per cent of people who had recently become adults were obese by the usual adult definition. They found similarly low rates of obesity for 18 year olds in the Brazil and Singapore over the same time period. The Netherlands had an even lower rate of 0.3 per cent but the USA had a much higher rate of 3.3 per cent for men and 4 per cent for women. Taken together, this suggested that the obesity rate among young British adults circa 1990 was less than two per cent and that a realistic cut-off point for childhood obesity was the 98th or 99th percentile. In a later study, Cole and Lobstein concluded that ‘the obesity cut-off is well above the 98th centile’. So that means we use the 98th percentile as the cut-off when estimating child obesity figures today, right? Wrong. We use the 95th percentile. Why? There is little justification for it in the scientific literature other than that it is the convention. Cole himself says that the methodology is ‘all built on sand.‘ The most likely explanation for dropping the cut-off to the 95th percentile – if we exclude the possibility that it was deliberately intended to exaggerate the size of the problem – is that the USA did it first and we copied them. By the end of the 1990s, the USA had started using the 95th percentile as the cut-off for ‘overweight’, with the 85th percentile used to define ‘at risk of overweight’ – terms that would later be changed to ‘obese’ and ‘overweight’. This was not wholly unreasonable. The rise of obesity in America began earlier than it did in Britain and rates of obesity have always been higher. It is likely that around five per cent of American children were at least overweight, if not obese, by the end of the 1980s and would therefore have been above the 95th percentile. Whatever the reason for using the 95th percentile, it has had the effect of greatly inflating childhood obesity figures in Britain for as long as they have been recorded. It implicitly assumes that five per cent of 18 year olds were obese in 1990 when we know that the real figure was less than two per cent. Starting from this false premise, everything that follows from it is wrong. Forced to pretend that the child obesity rate in 1990 was more than twice as high as it was, we are given child obesity statistics for the present day that are likely to be off by a similar margin. We are classifying huge numbers of children as obese who would not have been diagnosed as such by a doctor in 1990 and would not be diagnosed as such today. If you look at the chart above, you will see that the 95th percentile is not even shown on it. It is of no clinical relevance. The result is that we get figures which defy credibility. Take a look at the latest obesity statistics for adults from the Health Survey for England. The pattern is typical of a developed country, with rates rising steadily as people get older and then dipping in old age. Now let’s add the childhood obesity figures which are measured in a totally different way. As you can see, they do not link up at all. Both groups of children have a higher rate of obesity than the young adults, with the rate among 11-15 year olds being more than twice as high as that of 16-24 year olds. To take these statistics seriously, we have to believe that obesity rises rapidly in secondary school, affecting nearly a quarter of children, before suddenly plummeting to barely a tenth of children once they become adults. These figures are for 2016, but the same picture emerges if you go further back in time. Since 2001, every year (except one) shows rates of obesity for 11 to 15 year olds at between 18 and 25 per cent while the rates for 16-24 year olds are between 10 and 13 per cent. The current batch of 16-24 year olds have an obesity rate of 11 per cent, but when they were in school a few years ago they had an obesity rate of around 20 per cent. This is a remarkable feat of weight loss, especially when you consider that we have recently been told that ‘four out of five obese schoolchildren will remain dangerously overweight for the rest of their lives’. When parents are asked about their supposedly obese children, only 52 per cent of them say that they are ‘too heavy’. When it comes to children who are ‘overweight’ – a truly meaningless category based on the 85th percentile – only 11 per cent think they are ‘too heavy’. The children themselves agree. Only 51 per cent of ‘obese’ children and 17 per cent of ‘overweight’ children think that they are too heavy. Rather than reassess their methodology, obesity campaigners accuse these families of deluding themselves. Parents who reject the diagnosis of an arbitrary and patently flawed mathematical assumption are accused of being ‘no longer able to tell whether their children are overweight’. They are said to be suffering from ‘Goldilocks Syndrome‘. Never mind Goldilocks. The Emperor’s New Clothes is the more appropriate fairy tale analogy here. We are told that obese children roam the streets in vast numbers: one in five 11 year olds, rising to one in three if you include the ‘overweight’. No one can see this many obese kids with their own eyes and yet we go along with the illusion, perhaps assuming that they live elsewhere. If you met these ‘overweight’ kids, you would probably agree with their parents and say that most of them are not fat. A doctor who examined the ‘obese’ kids would reject the diagnosis of obesity in hundreds of thousands of cases. This is not to deny that child obesity, like adult obesity, has risen over the years. Comparing today’s figures with those of 1990 shows a rise in children’s BMI, albeit one that peaked in 2004 before going into reverse. But we have no idea how many children are obese because the official statistics do not really measure obesity. Claims about a quarter, or a third, of children being dangerously overweight are for the birds. The true figures – if they ever emerge – are bound to be much lower than the numbers bandied around in the newspapers. How have average heights changed, and what does that do to using 1990 data. If I compare late teenagers today vs then I see a lot more who are ridiculously tall. “…one in three children aren’t obese…” surely should be “…one in three children isn’t obese”. No editors at the Spac Otter. Big companies make money on people’s habits, imperfections, and addictions. Like they did with me, when I smoked for 20 years, spent a fortune on cigarettes and had little left from my health. Now I quitted 5 years ago and feel much better. I picked the best squonk mod https://vapehabitat.com/squonk-mod/ available then on the market and slightly switched from tobacco to low-nicotine vape juice. Now I vape only from time to time and nicotine-free vapes. Excellent work Mr Snowdon. Is there any hope that anyone in the MSM and politics will take note and do something about this? Ending the public health gravy train in the interest of public happiness and the maintenance of some vestige of public respect for science and government would be a start. Just measure their waists and for obese say fat. Simple. the problem is theoretically BMI should go up as weight / height cubed (not squared). If you think about the body as a simple cuboid if we increase one length all three lengths should increase in proportion and the weight therefore go up by the cube of the length.